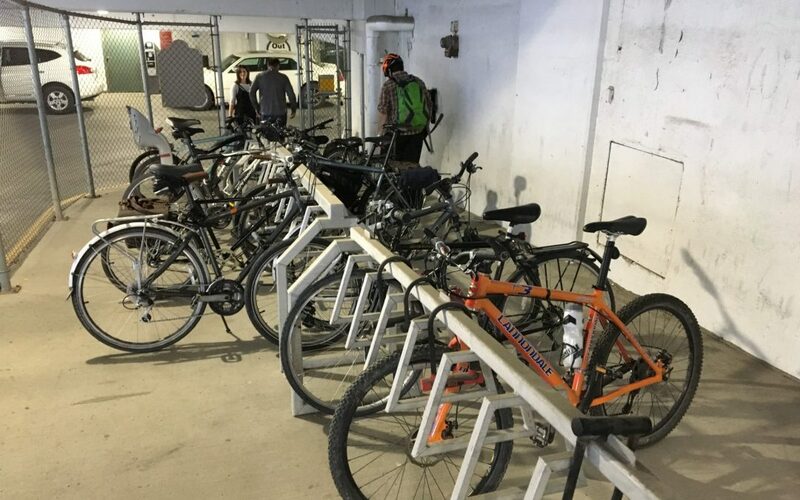 As more people opt to use their bike for the daily commute to work, there are bike parking implications that employers need to consider. It means looking beyond the car and welcoming all commuting options at their workplace. Given employees will be leaving their bikes unattended all day, secure bike parking is a top priority. This could take the form of an indoor room, a bike cage in a parking lot or parkade, or other secure facilities with restricted access. Installing the proper parking for bikes requires some attention to get it right. There are a large variety of bicycle sizes, shapes and attachments that require different accommodations. Employers will want to consider all options, as taking the “easy way out” may result in dissatisfied employees and low uptake. Interest in bike parking goes beyond employees commuting to work as well. Customers and tenants also expect to be able to park their bikes easily and securely. An external bike rack at the front door to a workplace provides short-term parking for visitors or clients. Because they are there for only an hour or two, their top priority is convenience over maximized security. This guide can therefore be applied to commercial, retail and residential complexes as well. By creating a cycle-to-work standard for all employees, clients and visitors, businesses and workplaces give everyone the opportunity to choose a healthier and cheaper commute.